Katherine Noyes proves why you should not to switch to Linux. 1. >> You wake up one day and realize you’re tired of paying for an operating system that’s more bogged down with bugs than most alpha builds are. I could say the same for Linux, and who wants to install a moving target? Every six months Linux distro’s such as Ubuntu, Fedora release new versions which users have to upgrade to if they want to keep up with supported packages and get user support from the Linux community. Can you run a version of Ubuntu from 2004 and get support today? What about Redhat versions from 2002 or 2001? >> What, exactly, are you paying for here? With Windows, you pay for peace of mind. You are guaranteed that the product will be supported and that there is a healthy community around the product with available software and hardware devices that support it. I know Windows, everybody knows over 1.2 billion Windows users know Windows and can get free or paid support if they want it. >> Then, of course, there’s also all the antivirus software you have to buy to keep it running. Malicious code is released for Linux, just that you same Linux users hide that information and because of its small market share, its not much news to anyone but Linux users. As for Antivirus, there is both free and commercial solutions. I personally am running Microsoft Security Essentials, but you also have Free AVG, AVAST! Home. Katherine, don’t be this naive, it makes you look like you don’t have a clue what you are writing about or don’t do any form of research on your articles. >> Linux, on the other hand, countless developers around the world are working around the clock to keep the 100 percent free operating system at the head of its class. Well, they are doing a lousy job, last time I checked, Linux is at 0.85% while Windows 7 is currently at over 300 million users. 2. >> If you find yourself upgrading perfectly good hardware just because resource-hungry Windows demands it, you might be using the wrong operating system. I am using the same HP Deskjet HP 840c I bought for Windows 2000 Professional on Windows 7, plug it in and the drivers are installed automatically. Same can be said for my HP ScanJet 2400. My Digital camera I purchased in 2006 works with Windows 7, so does my C350 World GPRS Modem I got in 2000. I don’t understand what you mean by resource hungry either, because I am running Windows 7 Professional 32 bit on the same DELL I bought in March of 2004 with Windows XP Home, same specs, I only upgraded the RAM because I use programs like Photoshop and AutoCAD and I have a lot of applications open, but its the same specs, 3.2 GHz HT Northwood, nVidia Geforce FX 5200 128 MB AGP, all the same components working just fine, the no performance issues here. I will admit, Windows is a target, but what do you expect with 1.2 billion installations versus Linux with 0.85%. Windows 7 has a lot of built in protections, first of all, you are not the root Administrator since the operating system installs with a Standard Administrator which does not have access to the critical parts of the system that malicious code can infiltrate and cause damage. On top of that, you have technologies such as UAC which prevents unauthorized apps from writing to areas of the system without your permission. ASLR helps to prevent malware from attacking the system because it shifts around key operating system code on boot up to fool malware. Also, you have technologies like Stack Heap Protection, BitLocker Drive Encryption, EFS, Protected Mode in IE, AutoRun is disabled by default, System Restore, Backup and Restore Center with System Imaging along with a good free Antivirus such as MSE and using Automatic Updates which takes care of updating Windows, Office, Windows Live services and even your drivers with a good set of built in File and Permission settings. If you are paranoid even more, you can setup a Limited User Account for extra security. If you have Automatic Updates turned (which it is by default), you don’t have worry your little head off. You are acting like Linux was designed by aliens (probably because its next to impossible understand or use). I guess that’s over a billion users have chosen Windows. 5. >> Who among us doesn’t enjoy spending hours at a time scanning for viruses and spyware and defragmenting? All of these task are automated, Windows Vista introduced a low priority defragmenter that runs in the background on a single thread to keep your Windows 7 system optimized at all time. As for Scanning for Antivirus, you might have to do those things manually through the command line on Linux, but in Windows its automated and you can setup schedules to do it for you without clicking a mouse. >> Well, probably all of us don’t enjoy that, actually. Then, too, there’s all that unplanned downtime. Don’t we have other things to do? Its probably down time for someone like you who spends every winking hour in front of their PC or you are using a 486 DX or you just don’t have a life. Like going out, taking pictures, enjoying time with family friends, having an actual social life. You sound like someone who sits in front of a PC waiting to see the next update come through the Ubuntu Software center. That’s called pathetic. 6. >> If Windows’ boot speed were faster, when would you make your coffee? Right. Sadly, that argument doesn’t quite cut it anymore. Well, you have a number of options such as Sleep, Hibernate and normal booting. Remember that Windows 7 includes trigger starting of services, so only essential services are loaded on boot up and services can be loaded on demand. So if you are going to watch a movie, connect to a network, Windows will start those services when needed. Overall this provides a optimized system that is fast and efficient and works the way you want to. 7. >> Your business associate in Berlin tried to send you an .ODP file–based on the international standard file format–but PowerPoint wouldn’t read it properly. So much for interoperability. well, considering that over 750 million individuals use Microsoft Office everyday, sharing is not a problem. On top of that you can use free services such as Skydrive with Office Web Apps to view, edit and collaborate on Word documents, Excel Spreadsheets and PowerPoint Presentations. If you need to share something with the very slow and buggy OpenOffice, you can save Office documents in the .ODF format. 8. >> It’s no accident Internet Explorer’s market share is slipping, and vulnerabilities are a big part of it. Then, too, there’s the monoculture effect making it all worse. You know, if this was 2005 and it was Internet Explorer 6, I would agree with you. Microsoft has updated its browser and kept pace with the competition. 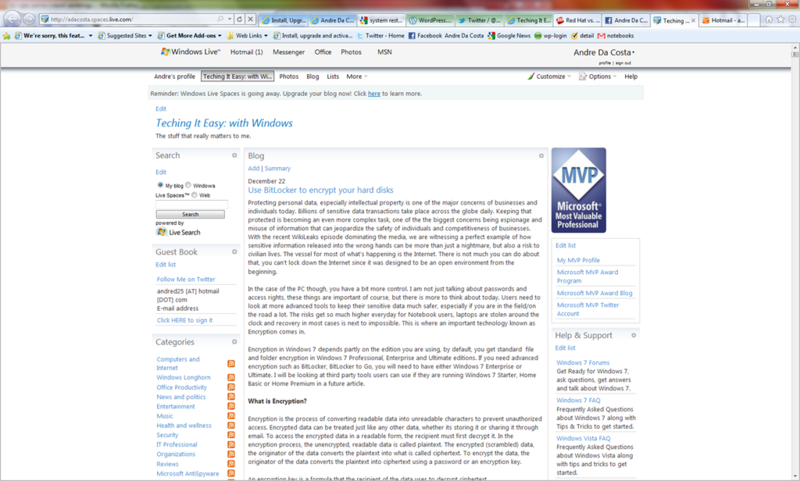 Features like Protected Mode introduced IE 7, InPrivate Mode. Also, with Windows, you can run all of the popular web browsers out there without the need to switch to Linux. On top of that, Windows versions of popular browsers introduce all the top features first, Linux and OS X have to wait months or even years to get certain features. Examples include updated UI, Accelerated graphics that actually utilizes the hardware. 9. >> It’s no longer fun waiting to see when Microsoft will fix bugs, or what new features it will come out with. You’re ready to start driving changes like that yourself. Oh please, those who care about writing and compiling code would already be running Linux, so you would basically be preaching to the choir. People have important things to do with their life instead of being full time evangelist for an OS. 10. >> Though it can be altered in very small, superficial ways, Windows can’t hold a candle to Linux when it comes to customizability. Are you just another face in the crowd? Of course not, and Linux recognizes that. 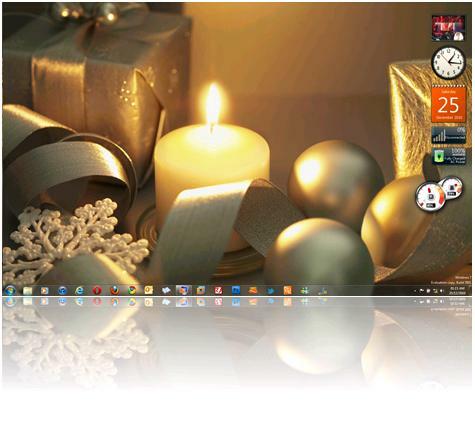 You can customize Windows to your hearts content too. 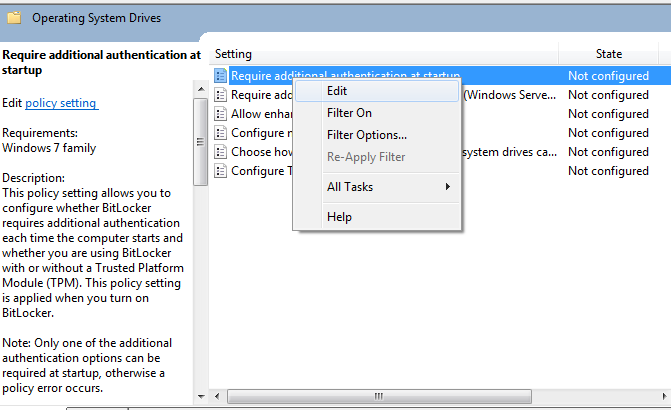 In Windows 7, click Start, type: Turn Windows Features on or off, hit Enter. Uncheck what you don’t need. If you don’t like the interface, right click the desktop and click Personalization or you can download a free utility like StarDock Object Desktop and customize Windows to your liking. Windows 7 is way more culturally aware than Linux or OS X, it includes a vast collection of themes that represent people and their culture and things they like about their culture. It supports a large collection localizations that makes Windows 7 feel like it was made just for them, you can even create your own themes and share them with friends and family. >> Is Linux perfect? Certainly not. But it is a lot better than Windows in so many ways. Isn’t it time for you to finally make the switch? I have proven you are wrong, sorry, better luck next time. 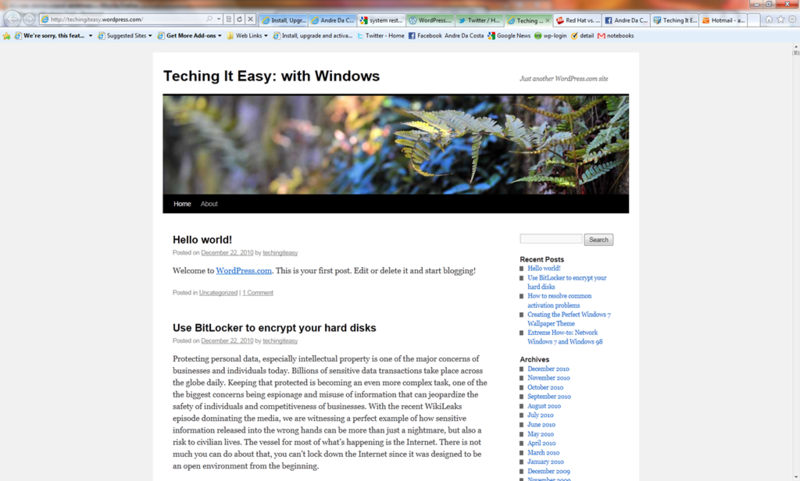 This blog post will chronicle my move to WordPress from Windows Live Space which I have been using since December 2004. I have been holding out a bit longer than I expected. 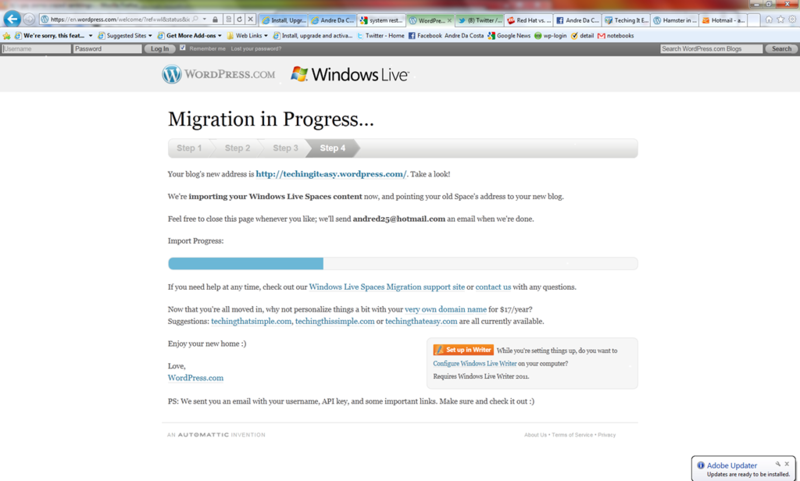 I must admit, I was a bit nervous about the whole thing, I just hope the migration is without any glitches. 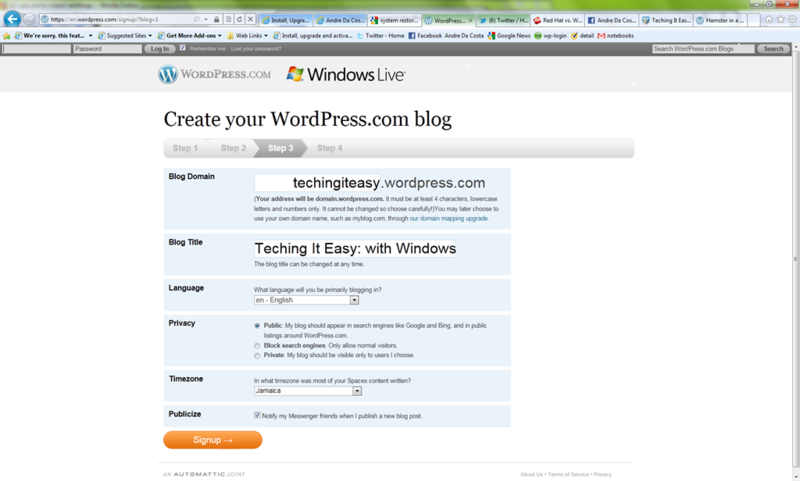 I have invested years of blogging into Windows Live Space and it would be a shame to lose any of it. Especially the pre-Windows Live Writer days. I didn’t start using Writer until 2006 when it first debuted in beta form, so there is a large collection of post I don’t have saved locally. 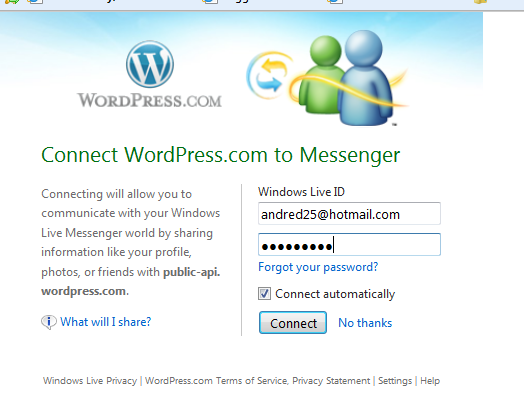 Since I don’t have a WordPress account, I will just use the handy feature of connecting my Windows Live account with WordPress. 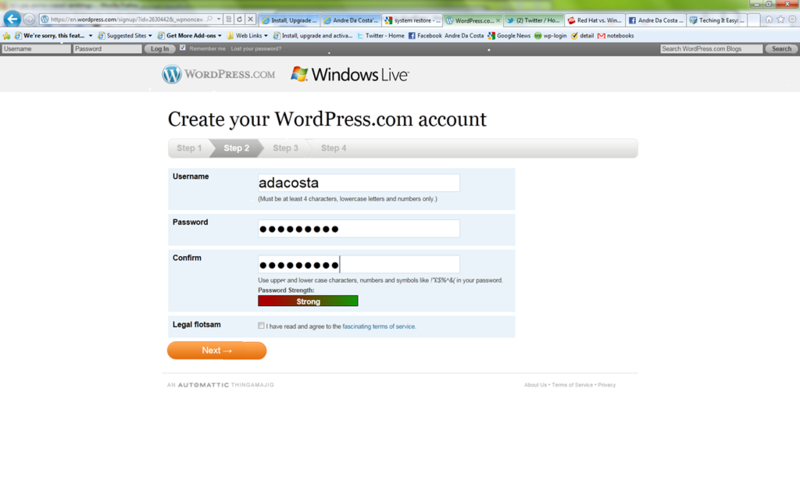 You know what’s even more annoying, the blog that is named adacosta.wordpress.com has only one blog entry and has not been updated since January 2008. 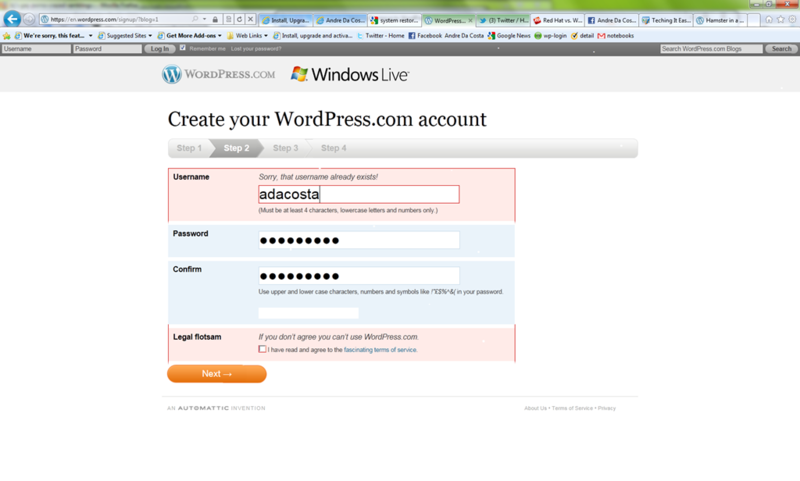 WordPress should do something about inactive blog accounts like that. 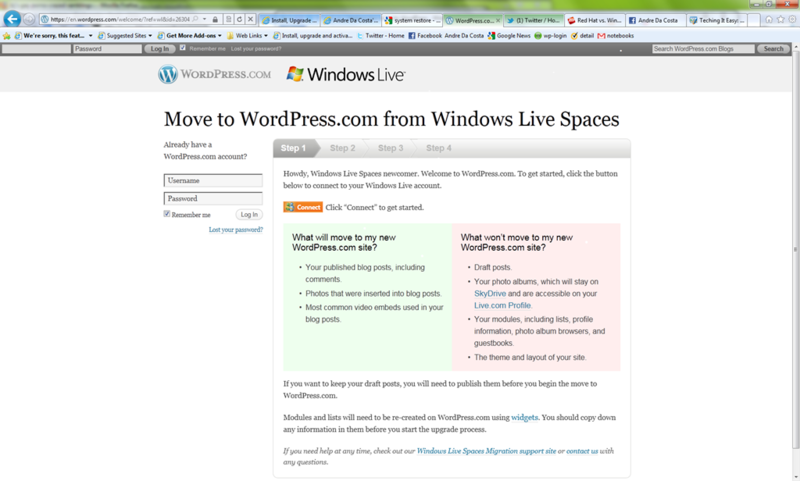 We are now upgrading your Windows Live Spaces blog to WordPress.com and it will be ready to use soon. Though the process could take as long as a day, it usually happens faster than that. If you experience any issues with your upgrade, please check out our Windows Live Spaces Help Center for resources and contact information. Your visitors using bookmarked Spaces links will be automatically redirected to WordPress.com. If you choose to connect with Messenger Connect, a link to your WordPress.com blog will also be added to your profile and your friends will be able to see and comment on your blog posts right from Messenger. 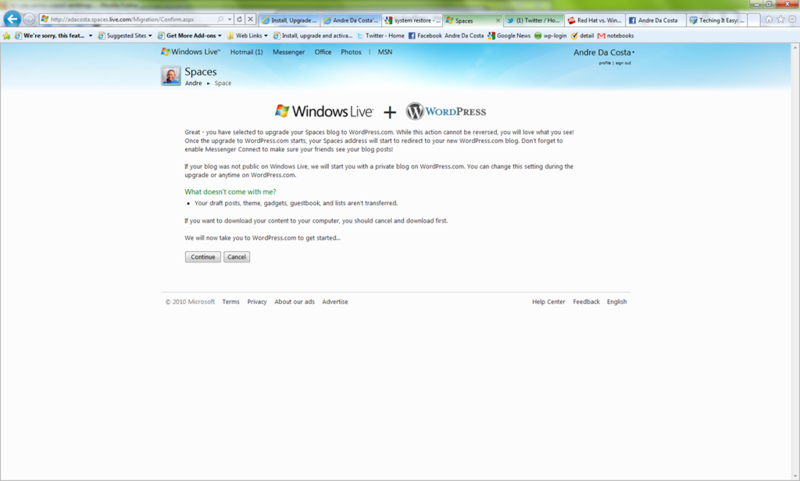 You can manage services that you’ve connected to Windows Live on the Manage Connected Services page. We hope you’ll enjoy this new experience. Thanks for using Windows Live! So far, so good. I might have to do some customizations first before I call it ready. Protecting personal data, especially intellectual property is one of the major concerns of businesses and individuals today. Billions of sensitive data transactions take place across the globe daily. Keeping that protected is becoming an even more complex task, one of the the biggest concerns being espionage and misuse of information that can jeopardize the safety of individuals and competitiveness of businesses. With the recent WikiLeaks episode dominating the media, we are witnessing a perfect example of how sensitive information released into the wrong hands can be more than just a nightmare, but also a risk to civilian lives. The vessel for most of what’s happening is the Internet. There is not much you can do about that, you can’t lock down the Internet since it was designed to be an open environment from the beginning. In the case of the PC though, you have a bit more control. I am not just talking about passwords and access rights, these things are important of course, but there is more to think about today. Users need to look at more advanced tools to keep their sensitive data much safer, especially if you are in the field/on the road a lot. The risks get so much higher everyday for Notebook users, laptops are stolen around the clock and recovery in most cases is next to impossible. This is where an important technology known as Encryption comes in. Encryption in Windows 7 depends partly on the edition you are using, by default, you get standard file and folder encryption in Windows 7 Professional, Enterprise and Ultimate editions. 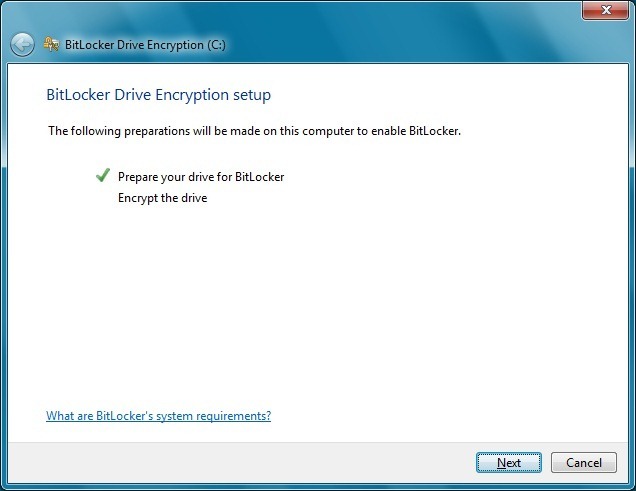 If you need advanced encryption such as BitLocker, BitLocker to Go, you will need to have either Windows 7 Enterprise or Ultimate. I will be looking at third party tools users can use if they are running Windows 7 Starter, Home Basic or Home Premium in a future article. Encryption is the process of converting readable data into unreadable characters to prevent unauthorized access. Encrypted data can be treated just like any other data, whether its storing it or sharing it through email. To access the encrypted data in a readable form, the recipient must first decrypt it. In the encryption process, the unencrypted, readable data is called plaintext. The encrypted (scrambled) data, the originator of the data converts the plaintext into what is called ciphertext. To encrypt the data, the originator of the data converts the plaintext into ciphertext using a password or an encryption key. An encryption key is a formula that the recipient of the data uses to decrypt ciphertext. 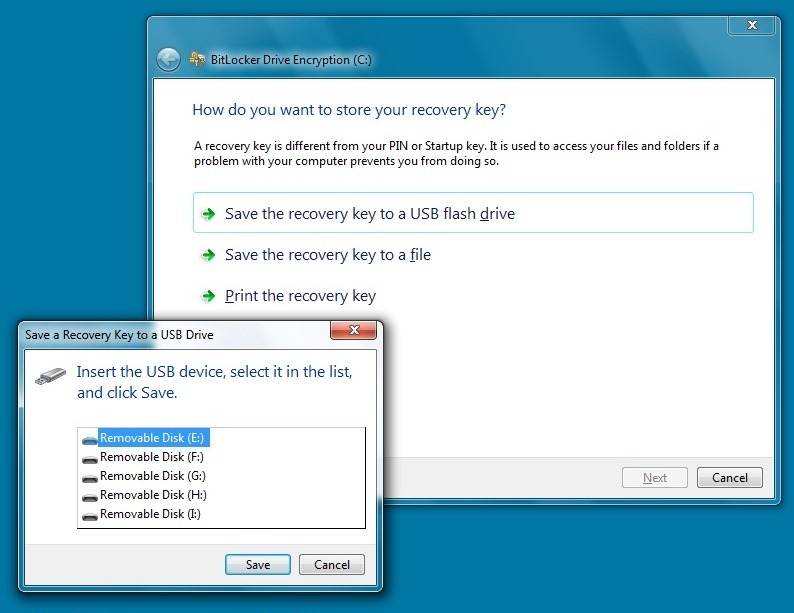 As I noted earlier, there are two types of encryption available in Windows 7 depending on the edition. In the case of Windows 7 Professional, you only have the Encrypting File System which only supports encrypting Files and Folders. If you are running the Enterprise or Ultimate editions of Windows 7, you will get access to more powerful tools built in. 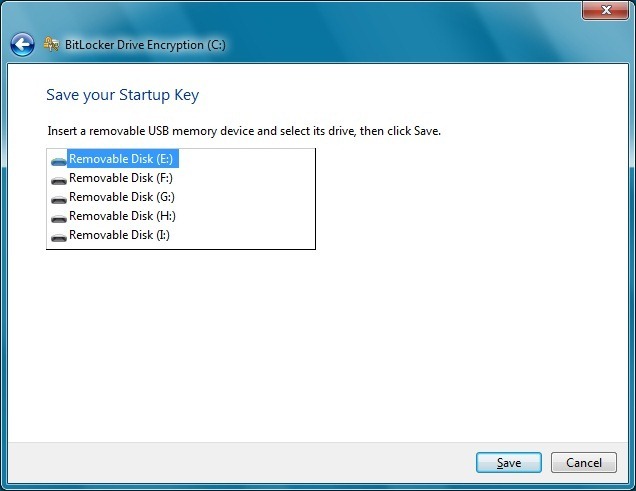 A feature first introduced in Windows Vista called BitLocker Drive Encryption allows you to encrypt a fixed hard disk. 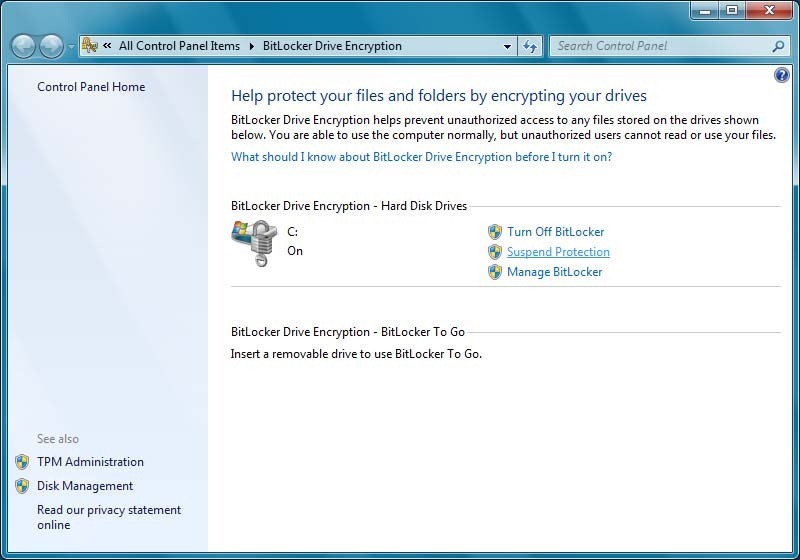 BitLocker Drive Encryption can help to protect all files stored on the drive Windows is installed on (operating system drive) and on fixed data drives (such as internal hard drives). 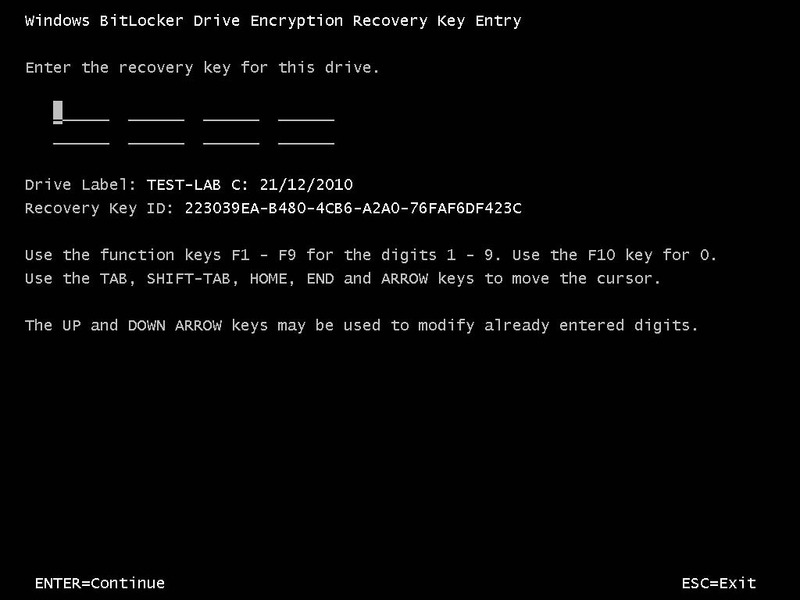 Unlike Encrypting File System (EFS), which enables you to encrypt individual files, BitLocker encrypts the entire drive. You can log on and work with your files normally, but BitLocker can help block hackers from accessing the system files they rely on to discover your password, or from accessing your drive by removing it from your computer and installing it in a different computer. 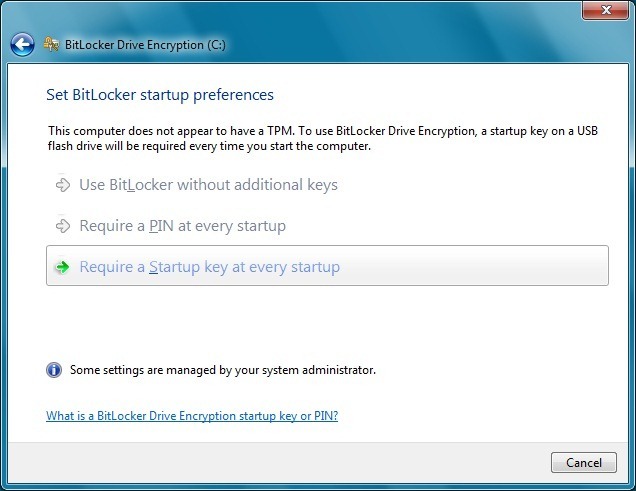 If you encrypt the operating system drive, BitLocker checks the computer during startup for any conditions that could represent a security risk (for example, a change to the BIOS or changes to any startup files). 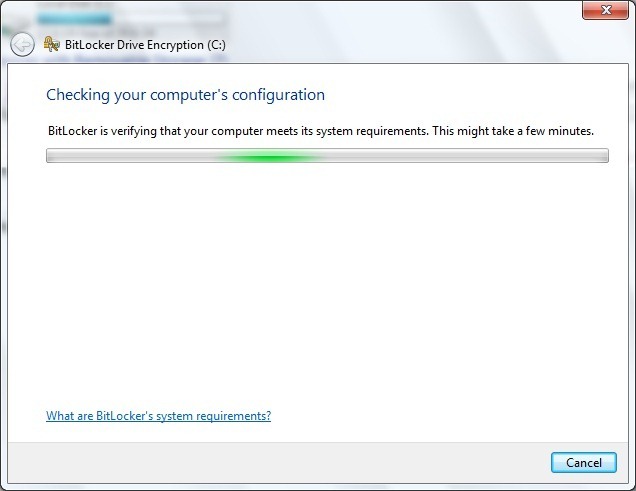 If a potential security risk is detected, BitLocker will lock the operating system drive and require a special BitLocker recovery key to unlock it. 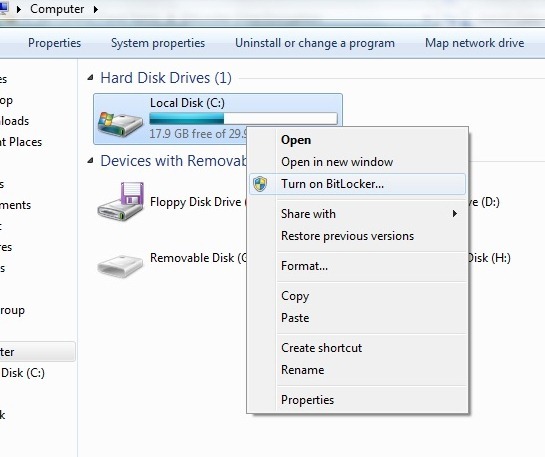 Make sure that you create this recovery key when you turn on BitLocker for the first time; otherwise, you could permanently lose access to your files. 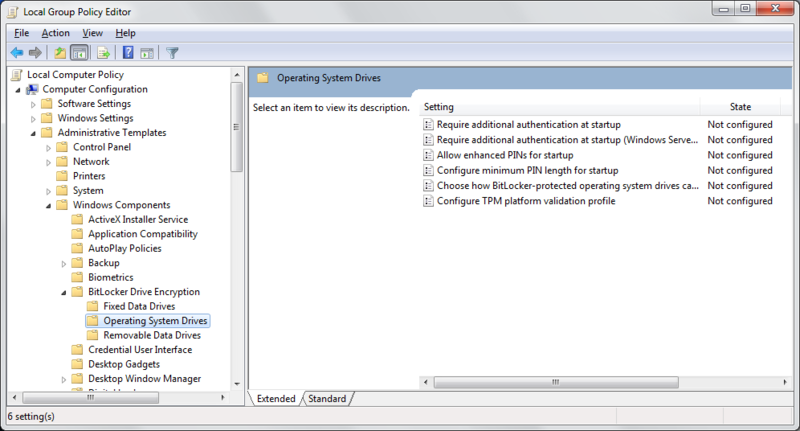 If your computer has the Trusted Platform Module (TPM) chip, BitLocker uses it to seal the keys that are used to unlock the encrypted operating system drive. When you start your computer, BitLocker asks the TPM for the keys to the drive and unlocks it. Then hit Enter on your keyboard. 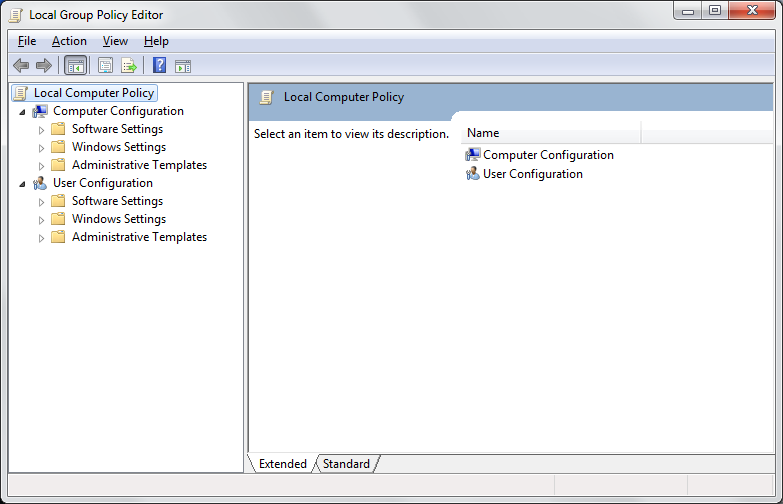 This will open the Local Group Policy Editor (please note I am working on Windows 7 Ultimate). Next, click Start and type: gpupdate.exe /force then press Enter on your keyboard to enforce changes, restart your system just confirm things. We are now ready to encrypt our internal hard disk. 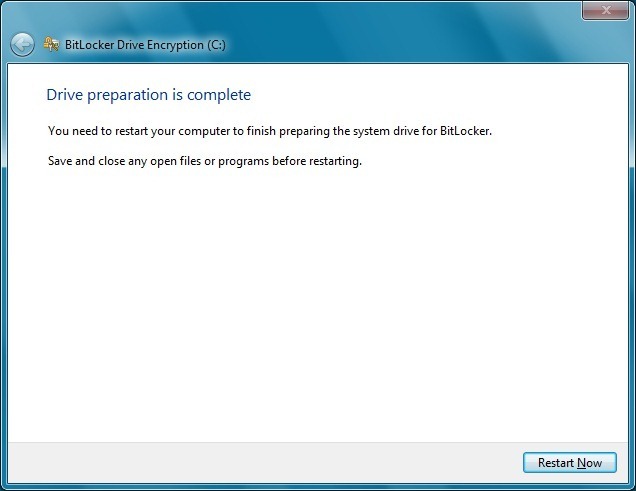 BitLocker will prepare a reserved hidden partition of approximately 300 MBs for encryption data. Making changes to the drive. Restart your system to confirm changes. 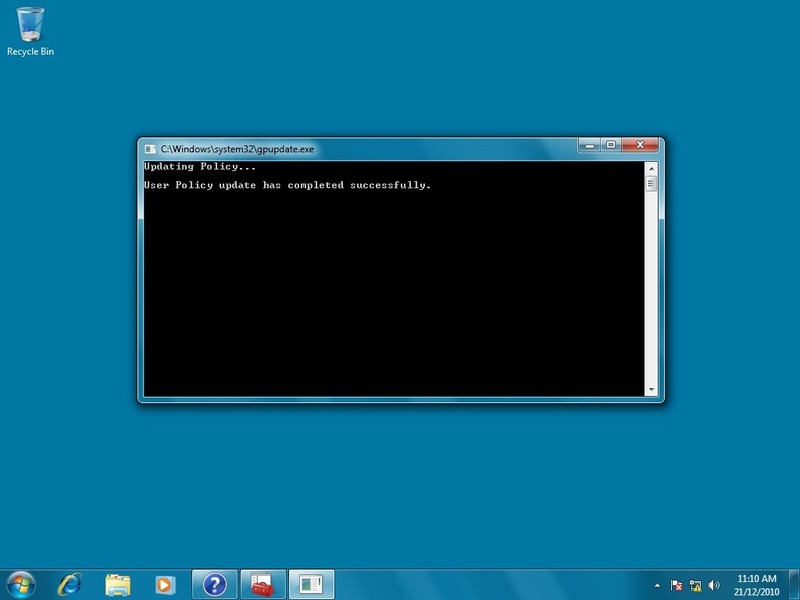 After restarting, the wizard will then continue with the encryption process. I strongly implore that you have a USB thumbdrive, in fact, you will need it to move forward. Having a thumbdrive to store the encryption key somewhere safely is important when you need to decrypt the drive to access the operating system and your personal files. Select the location where the Encryption key will be stored. 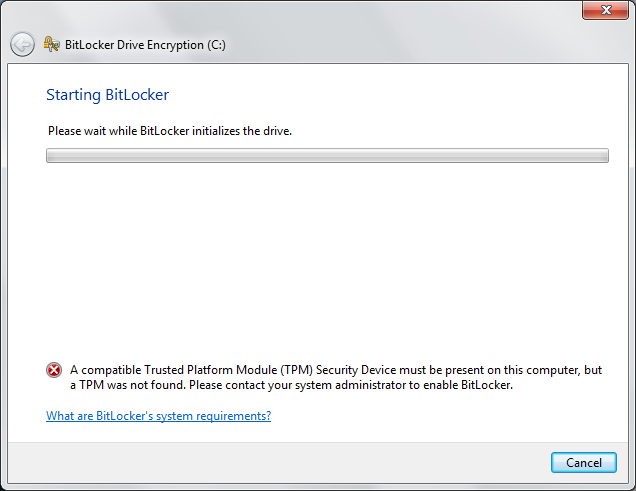 BitLocker will do a trial run just to make sure the thumbdrive can decrypt the hard disk drive. If it is not possible to use the thumbdrive, you can still do the encryption, but you will need to remember the 48 character encryption key. That’s why it is best that you have it stored somewhere safe or print it and store it safely so you can reference it when you need to. The reason why it might not be possible to use the thumbdrive as a Start up key, the thumbdrive is not formatted using a supported file system such as exFAT, FAT 16, FAT32 or NTFS or your BIOS needs to be updated. 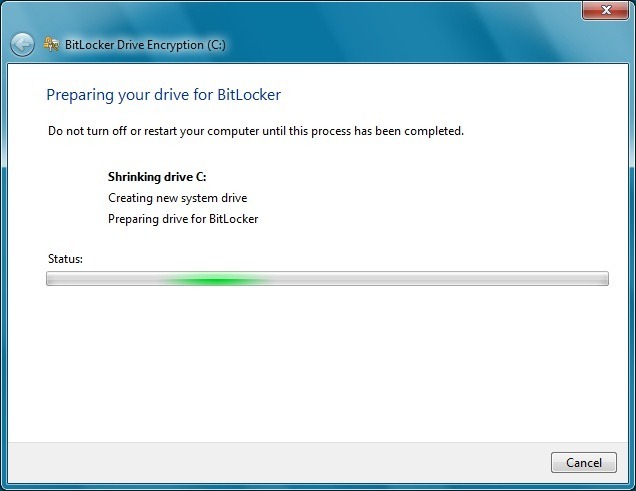 If all goes well, when you start the computer, the BitLocker Drive Encryption program will automatically start, if not, you will receive an error. 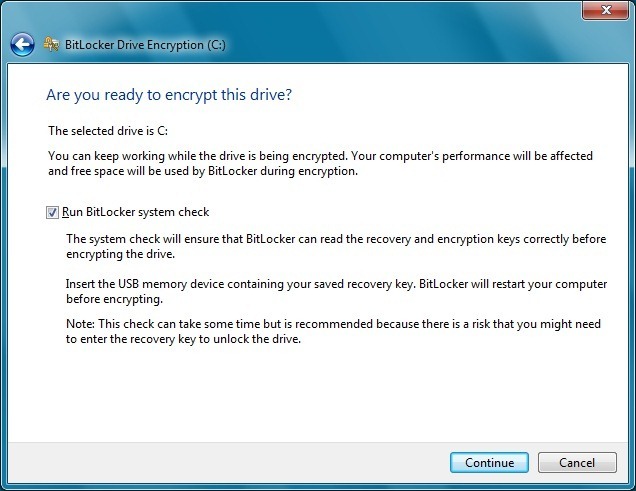 Recommendation, re-run the BitLocker Drive Encryption wizard again, but this time, uncheck Run BitLocker system check then click Continue. Again, please be sure you have access to the key or its printed or you have memorized all 48 characters in the encryption (which I personally think is next to impossible for most persons). The reason why the character is so long is to make it harder to be cracked. The longer and more complex the encryption key is the less likely it will be for a successful attack. Encryption can take some time depending on the size of the drive, you can continue using your computer while it does its thing. When you open Computer (from the Start menu), you will now notice a Padlock emblem on your hard disk, this indicates the drive is now encrypted. 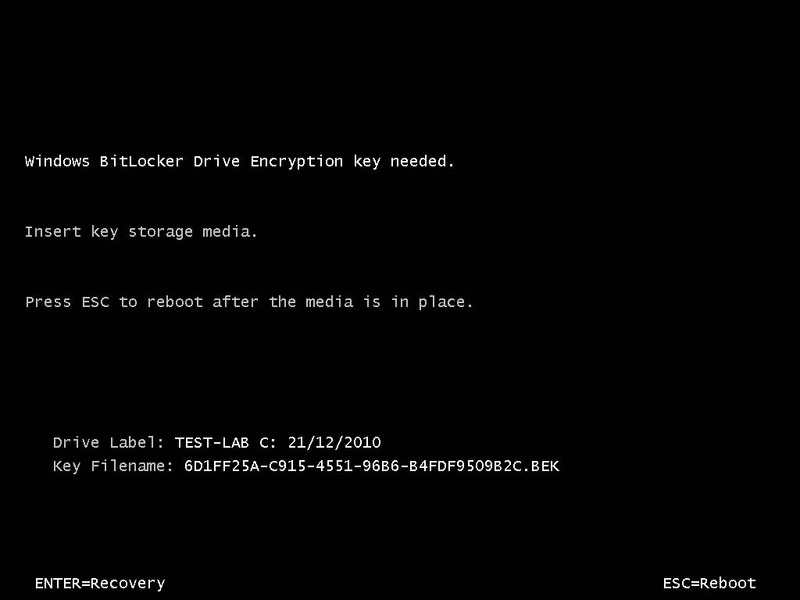 BitLocker now enabled on my hard disk. 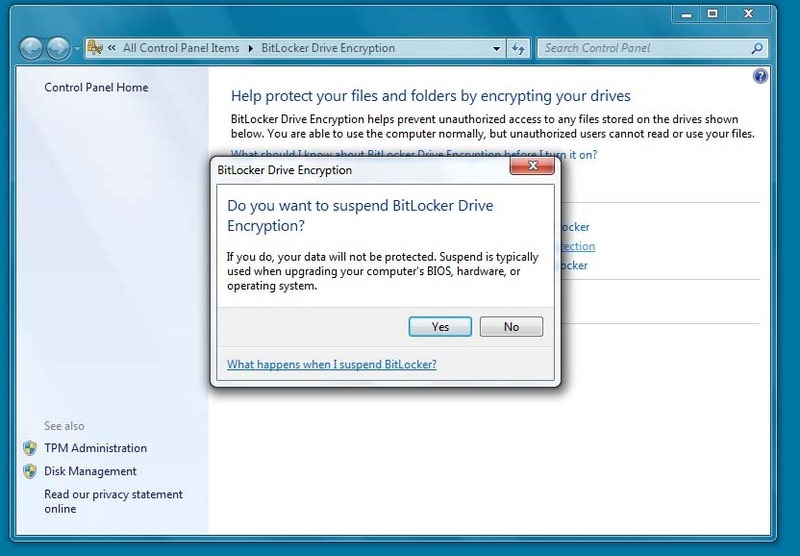 If you believe your data is at no risk of unauthorized access, you can suspend BitLocker Encryption. This is especially convenient if you are sharing a computer with someone such as your family at home where the risk is much lower for theft. You will now notice a exclamation emblem on the hard disk icon indicating that BitLocker is now suspended, you can click the Resume Protection link when you are ready to use it again. Again I, strongly recommend before using encryption software, at least have your hard disk backed up. Having your data secure is one thing, but not having access to it is another problem. 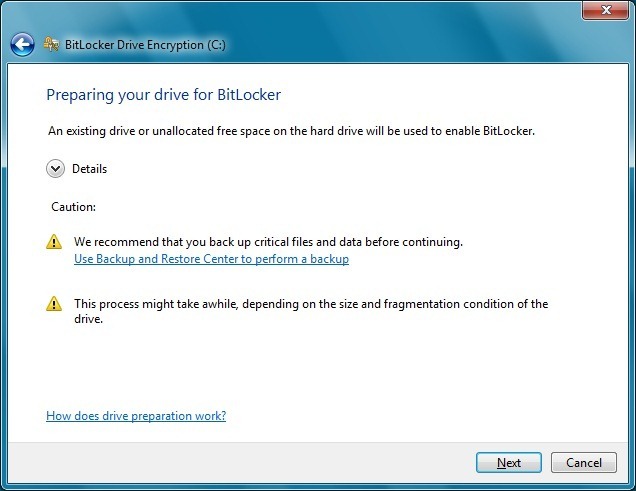 You can reference articles about how to backup your personal files and hard disk here and here When combined with practices such as password protection at the BIOS level and at Windows log on, BitLocker Encryption provides the most ultimate level of safety for Windows users. 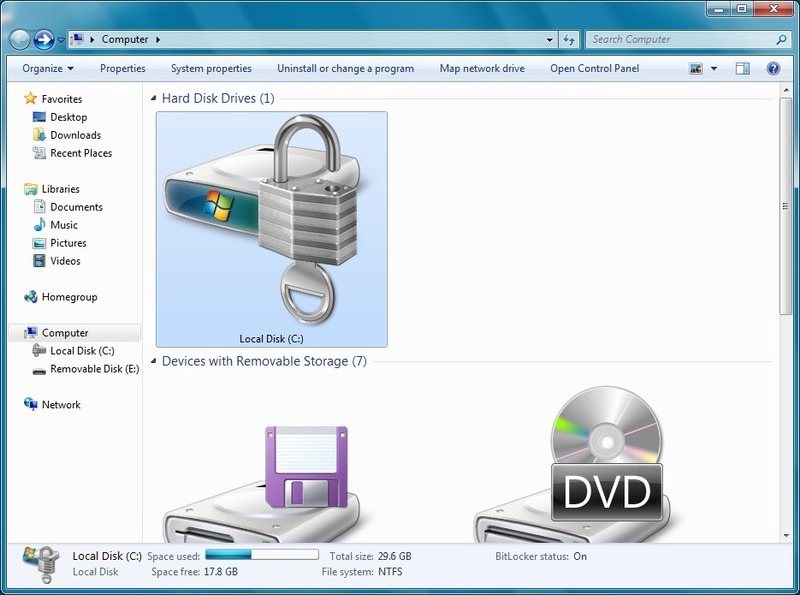 In a part 2 article, we will look at using a free disk encryption solution for users of Windows 7 Professional, Home Premium, Home Basic and Starter.